Perhaps you’ve seen this photo floating around Facebook? I know I have! 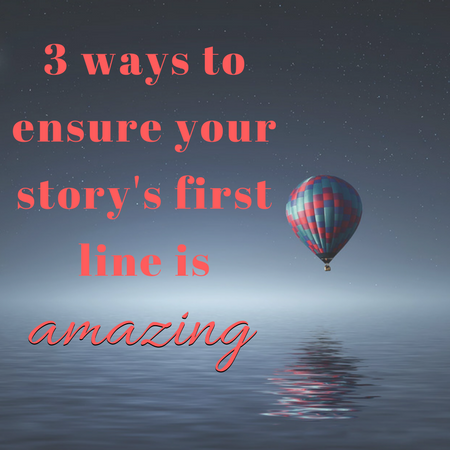 I know we’re talking about three different words here – not just one – but, in my book, these three all go together for one very simple reason: Many people just don’t understand (or don’t care) how or when to use each of these words correctly. 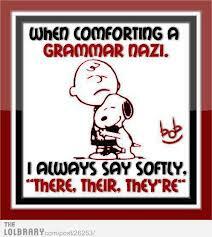 For example, check out this graph posted by Grammar 101 author Michael Kwan. 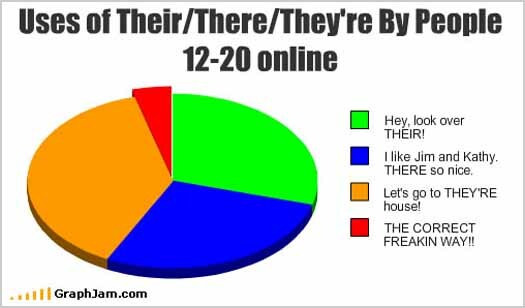 Now, granted, this graph represents the correct/incorrect homophone usage by a small online sampling of people ages 12 to 20, but I contend that this is not just an adolescent problem. Adults use these words incorrectly, too – both online and off. I know. I’ve seen it. A lot. 1). They’re is a contraction, which means “a shortening of a word, syllable, or word group by omission of a sound or letter”. In this case, two words are being shortened by the elimination of just one simple letter…an “a”. 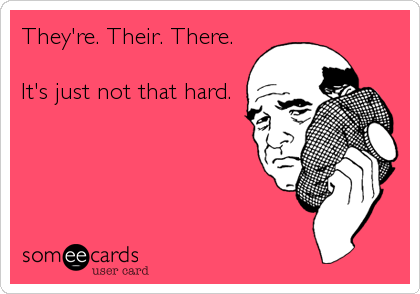 In order to make sure you’re using this homophone correctly, all you have to do is remember that you are, in fact, meaning to say “they are”. For example, “They are going to the movies after dinner tonight”. You just don’t want to spell it all out, so you say instead, “They’re going to the movies…” You see how that works? It doesn’t have to be confusing at all. 2). Their – third person plural possessive, as in “She took their cat for a walk on a leash yesterday morning”. Now, I know that the “tried and true” spelling rule doesn’t apply here…you know, the “i before e, except after c” rule. The “e” comes before the “i”. There’s no mistaking that. But here’s another way you can remember the correct spelling of this possessive word. Think of the singular possessive words, “her” and “his”. Look at the letters that are in the dead center of those two words – “e” and “i”, right? Okay. Now…try to remember the old-fashioned, chivalrous rule, “ladies first”. See where I’m going here? Take the middle letter from “her” and put it before the middle letter from “his” in the middle of the plural possessive, and there you have it – their. Simple! 3). Here’s the dictionary definition of “there”. There (adverb): In, at, or to that place or position: “we stayed there eleven days”; “I’m going in there”; “the opportunity is right there”. Now, here’s my tip for remembering the correct spelling of this word. The next time you’re writing and you think you might want to use this word (or one of the other spellings), ask yourself: Over where? Over there. Do you see what happens here? All you have to do is change one letter between the two words denoting place – “w” to “t.” And that’s how you can tell if you’re spelling “there” correctly, in this instance. Of course, this tip doesn’t really work so well in certain usages of the word “there.” I’m thinking, for example, of the following case: “There were two women who brought pink coffee cups to the breast cancer fundraising breakfast”. Also, don’t forget to sign up for my monthly newsletter for even more grammar and writing tips and more fun stuff! 🙂 It actually wasn’t an intentional one, but I might turn it into one now! I do that A LOT, apparently. I’m re-editing/revising my first book (Shadows of Thing to Come/Unyoked/Shadows of Things to Come), and I just found where I’d made the EXACT SAME error in that book. I’ve actually caught myself doing it in process on more than one occasion, as well. It’s just that, most of the time, I immediately fix it.